The busiest cameras in the UK made more than £3m in one year! New research has revealed the top 10 highest earning speed camera locations in the UK and the results are staggering. The busiest cameras across the country raked in more than £3 million in one year alone from fines! The new study carried out by the insurance company Carole Nash, discovered that one camera earned over £1,600 per day from motorists caught speeding. The camera in question is located on the A1 Northbound at Great Ponton, Lincolnshire and was responsible for catching more than 6,000 drivers in 2015 – this equated to £606,400 earned in fines for the period. According to the study, the second highest earning speed camera is located on the M180, West of the River Trent near Scunthorpe. This camera managed to catch 5,835 speeding motorists in one year, earning £583,500 as a result. The new investigation discovered that the top ten highest earning speed cameras located throughout the country earned £3,164,100 in fines collected from drivers caught speeding. The insurance company’s findings were gathered following a Freedom of Information request from the largest police forces in the UK and the results are from the year 2015. Three of the highest earning speed cameras within this time period were all located on the M25 and raked in £1,167,200 in driver fines. 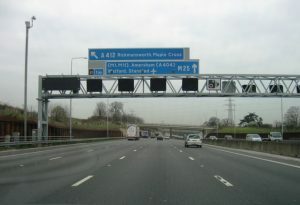 One camera located between Junction 17 and 18 on the M25 near Rickmansworth, Hertfordshire, was in charge of handing out 5,835 speeding penalties in 2015, after motorists were caught travelling at an average speed of 62mph in a 50mph zone. Motorists caught speeding face being fined the minimum penalty of £100 and given three penalty points on their licence, however new laws were introduced in the UK back in April, which could see serious speeders being penalised more severely, with fines starting from 150% of their weekly take-home salary. Despite the revelations of the new study and the rise in fine charges for more serious offenders, the police and road safety experts state that speed cameras are a powerful deterrent against speeding motorists and do help to reduce the number of fatal accidents on Britain’s roads. Please click here to find out more about our car leasing services and fantastic offers.